I have a secret. I love commercialization. Especially when it comes to Valentine’s Day. I’m not proud and I don’t often brag about it, but there’s something that makes me so darn happy about walking through Target and seeing all the pink and red dishes and towels and cookie cutters and more. Don’t even get me started on Michael’s Crafts at this time of year. HEAVEN. Valentine’s Day is the most commercialized holiday ever and it actually makes me pretty happy. Really, commercialization is a positive thing as long as consumers are smart about it (and realize the “holiday” is really about LOVE for everyone in your life). And it’s fun! Especially when it involves hearts and the color pink. So, yes, I get very into Valentine’s Day. It’s such a happy, lovey holiday, and whether you’re coupled up or not, it’s tough to deny that love is a wonderful thing! And if not, then chocolates, wine, and hearts made completely 100% of sugar most certainly are. That may be all you need. These sugar hearts are definitely filed under “crafty kitchen activities that Susie should never attempt.” But they also happen to be filed under “crafty kitchen activities that Susie desperately wishes she were good at.” This is also the first thing I’ve pinned on Pinterest that I’ve actually attempted in real life. 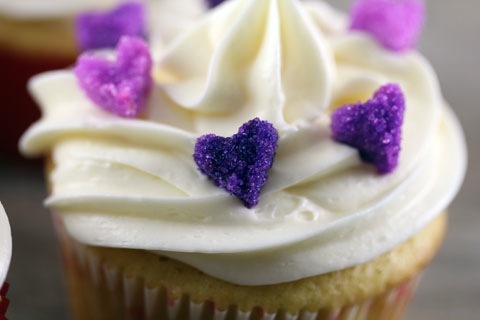 Of course, when you see how the ombre sugar hearts look on the cake on WeddingChicks.com, you’ll see why I was so tempted. And though mine aren’t nearly as fabulous, I’m still pretty excited by how pretty they are. Start by putting 1/2 C sugar in bowl. 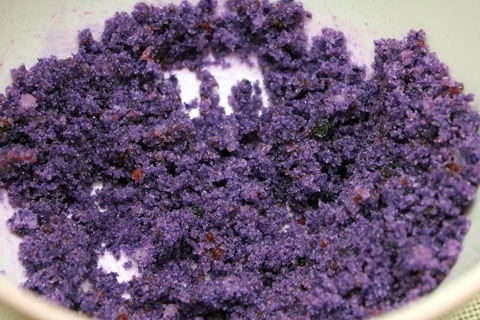 And mix in a bit of food coloring gel. I was so obsessed with the hearts on the Wedding Chicks blog that I wanted to attempt similar colors, in an ombre scheme. I used violet and pink gel food coloring. 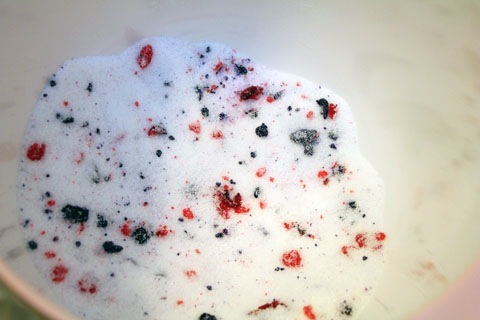 I *think* you could use liquid food coloring, but you just have to be careful not to let your sugar get too wet. Anyway, I didn’t have such luck mixing my gel coloring annnnd here’s what it looked like. Uh. I figured it would get better after I added my egg white and I was right. 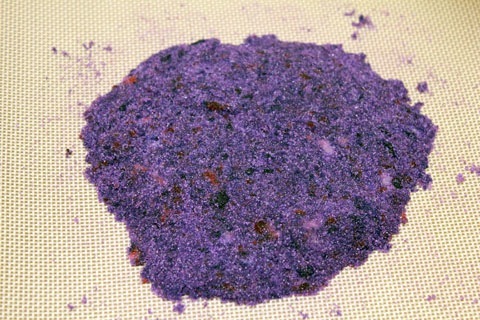 I added 1 t and stirred well and it was a much more vibrant, beautiful purple. 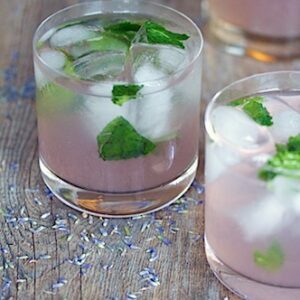 If you get to this point and want your color to be darker, you can added a little more food coloring. I ended up adding a tad more egg white because my sugar wasn’t clumping together enough. You just don’t want it to get too liquidy because then the sugar will dissolve. Horrors. Now pour the sugar out onto a Silpat or parchment covered cookie sheet. And pat it down with your hands to compress it. It should be level at about 1/4 inch. I was supposed to go over with a rolling pin, too, but when I tried, it started to split and spread apart too much, so I just kept using my hand to compress it. Now, using your little tiny cookie cutters, cut out hearts. This sounds a lot easier than it is. My sugar kept getting stuck in the cutter and I had to tap it with a knife several times to get the heart out. There were many casualties, but also some successes. As I went along, it got easier. If your hearts keep falling apart, try adding a bit more egg white to the mixture, so it will hold together better. You’ll want to move the hearts over to a separate lined baking sheet (you’ll be baking them for a bit). If you find that they’re falling apart as you pick them up, let them sit for a few minutes and they should harden a bit and be easier to move. OK! 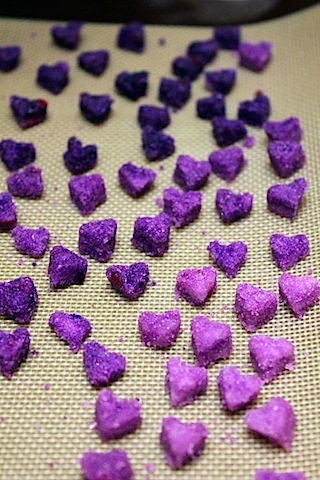 Once you have enough hearts of one color, you can make another mixture. I think I did about 20 dark purple hearts. 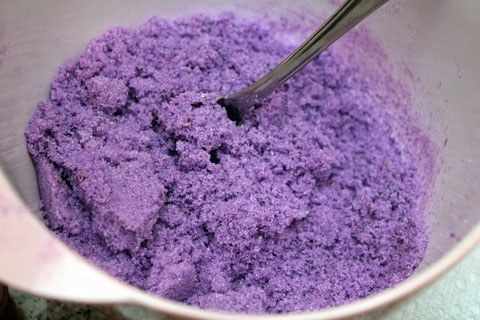 Since I was doing an ombre color scheme, I took the remaining sugar I had and put it back in the bowl. Then I added another 1/2 C of granulated sugar and stirred it up. And then another 1/2 C because it didn’t appear to be that much lighter. There; that’s better. And repeat. 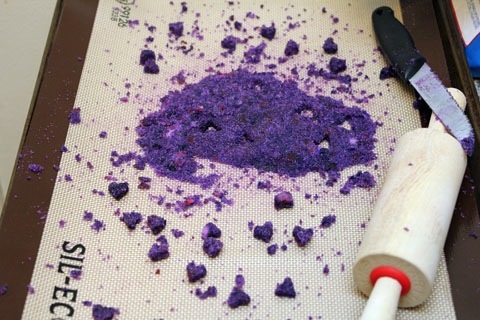 Put the sugar on a cookie sheet, flatten it, and cut out more hearts. 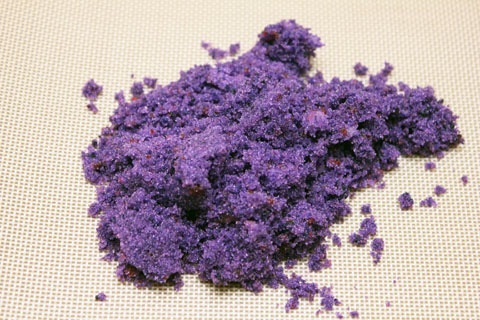 I did this a total of 3 times, making the sugar a bit lighter in color each time. I had A LOT of sugar and didn’t end up using it all because I was already on heart-overload. Then I lined all my hearts up on a baking sheet. 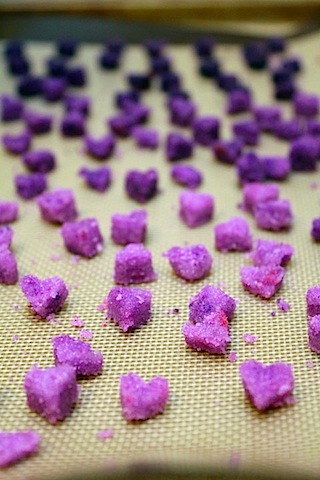 Then bake the sugar hearts at 200 degrees for about 10 minutes. Now they’re much easier to handle. And some of them even look like hearts! Swoon! Now you’re ready to decorate whatever you want with them. I wasn’t quite ambitious enough to make a Wedding Chicks style cake, tempted as I was, so I just made a simple vanilla cupcake and used the hearts for decoration. 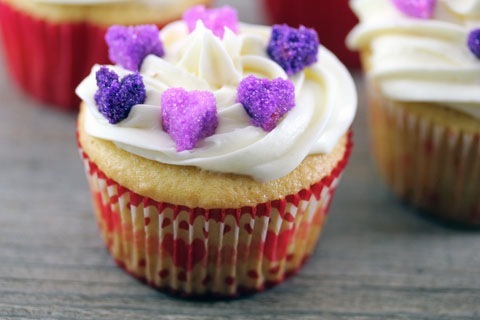 I think these sugar hearts add such a fun look to a regular old cupcake. But this is the kind of kitchen activity that, the more you do, the better you get at it. Which is why at first I wasn’t going to post these. Because how annoying will it be in a year from now when I’ve made these a few times and they look awesome, but I’ve already posted mediocre looking ones on the blog? But then i remembered that “We are not Martha” and that’s the point of this blog. To show you how things come out on our first go. Because duh, we are not Martha. And you know that. Right?? And to be honest, I was pretty happy with my first attempt. Next time, I may even try a Wedding Chick’s style cake. Or, I mean, do you think our wedding cake baker would be opposed to whipping up a couple hundred of these for our wedding cake? Because that would really be a dream come true. 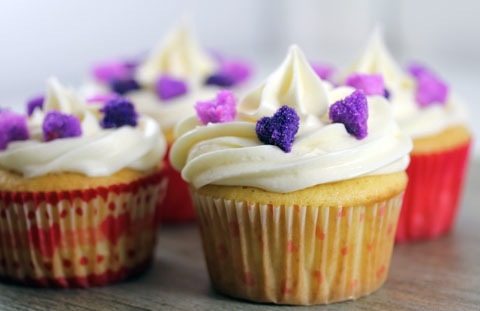 And also, I KNOW the last thing a sugary cupcake needs is to be topped with more pure sugar. But that’s not the point. 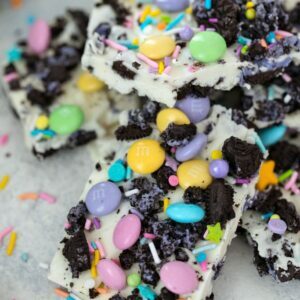 The point is, they’re pretty and fun and melt in your mouth, even when you tell yourself you’re not going to eat them because they’re just decoration. Oops. Plus, I didn’t succumb to Valentine’s Day commercialization with these sugar hearts. I strolled the aisles of target, swooning over all the pink hearts and then went home and made my own. With love. Baby steps. Do you get into all the Valentines-y fun or try to ignore it? 23 Responses to "Sugar Hearts"
LOVING this! 🙂 So pretty!! So cute!! 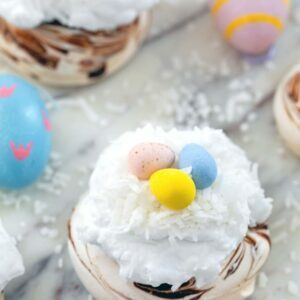 I probably lack the patience needed to make these but they make your cupcakes adorable! 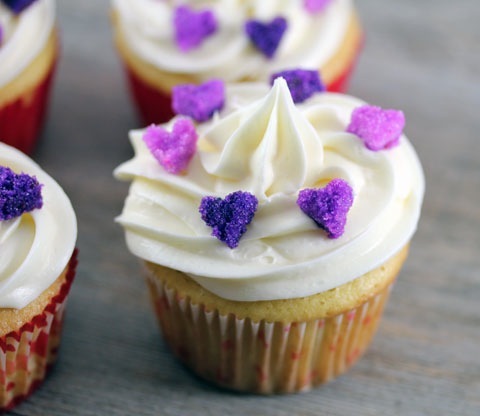 These sugar hearts are adorable! Life has been so busy for us lately that I’m just looking forward to a nice meal and chance to reconnect on Valentine’s Day. You continue to amaze me, Sues……………how do you do it all? …………and you do it all so well!! 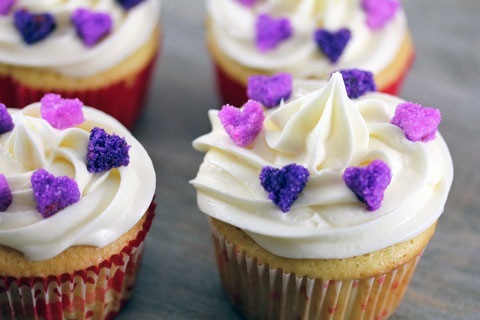 The cupcakes look so pretty with the little hearts on top! I’m a big fan of Valentine’s Day-themed things like this! I don’t over-decorate our house of anything, but I love making fun, V-day-themed baked goods (and having plenty of V-day candy) this time of year. I need to find those teeny tiny cutters. Those hearts are adorable! I would frame those pictures and put them on my wall!! SO PRETTY! These are so adorable! I love holiday (Valentine’s Day especially) themed goodies like these. 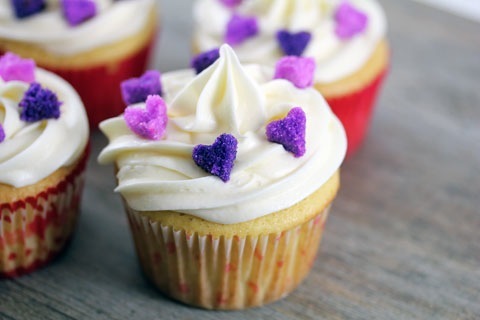 I love that you did the hearts in purple too! My favorite color. Your sugar hearts are so cute! While my boyfriend and I don’t give gifts or cards for Valentine’s Day, I still decorate and make Valentine’s inspired baked goods! Ooh yah! 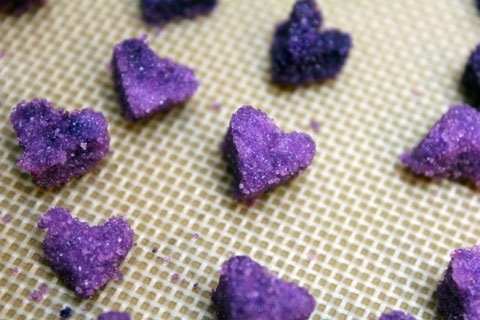 These are so pretty and even though they’re just sugar, I’d likely eat them by the handful. Impressive! I love V-Day mainly for the candy and baked goods! while I am all for celebrating love, I think V-day it way over-commercialized. I think it puts too much pressure on single people and young relationships. I do love your cute little hearts 🙂 I’ll look into getting some mini-cutters! 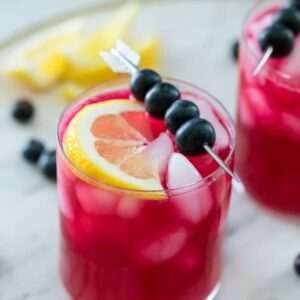 I’ve been slow getting into pinterest, but I just joined foodie.com. I think it will become my favorite social networking site from now on! Are you on it yet? Those could not be any more adorable! I like Valentines Day too – an excellent excuse for even more chocolate and wine than usual :). I had fun browsing the VDay section at Target last weekend! I can’t wait for all the candy to go on sale 🙂 These are so cute!